*Blue light illuminates on the target indicating that the clock is reset, and the system is ready to go. *The POD light will not illuminate after the race starts. Target lights up when touched! *Timer stops when the POD target is touched. The target POD lights flash for ~4 seconds, letting the climber know that the clock has stopped! Solid aluminum chassis construction. Includes a wall mounted bracket, and judge controller. This system conforms to IFSC rules for Speed Climbing. 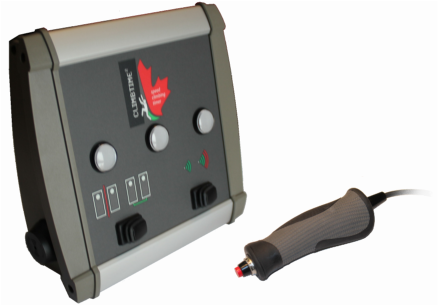 (International Federation of Sport Climbing), and detect false starts within 0.1seconds, and also includes satellite indicators at each route. The Speed Climbing judge has a remote start switch to start the race. Each climber stages at the start, when the judge resets the clocks, the center judge indicator illuminates blue, and the system indicates climber "READY" by illuminating a blue light on the controller, and on the satellite indicator lights to let the climbers know the system is in ready mode.. When the judge releases the start switch, a loud 1 second 98dB sound (volume high mode) is activated on each side of the competition controller, and both climbers clocks are started, and the satellite indicator lights turns GREEN. If a climber leaves the start before the judge starts the race, or false starts within 0.1 seconds, the buzzer will pulsate for approximately 4 seconds indicating a false start. 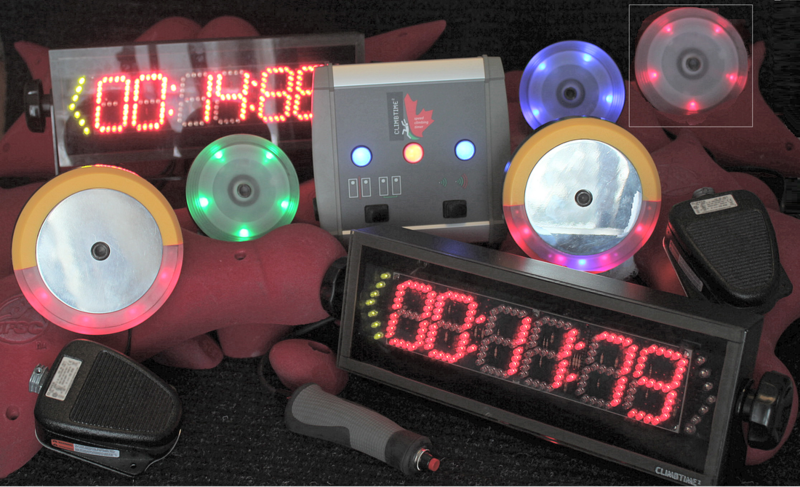 When a false start occurs, the competition controller climber lights, and satellite indicator lights will illuminate RED. The side that caused the false start fill flash RED. Selection for high or low volume. In training mode each route can be controlled by the climbers, or by judge triggering. The climber can step on the foot switch, and the coach\trainer will start the clock, with false start detection. The coach\trainer can train on both routes independently with the same judge controller, with climbers running at different start times! The climber can step on the foot switch and reset the clock, and climb without a coach\trainer\judge. Each wall is independent, and can be run at different times. False start detection is not active when used as climber controlled.